A note from Laura, Senior Editor at jaBlog! 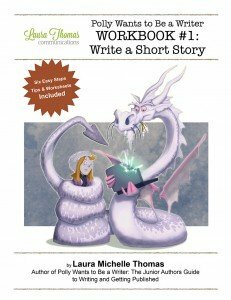 These young writers on our Insider Mailing List took up the challenge of crafting a letter that would convince me to give them a free copy of my 15-page short story workbook Polly Wants to Be a Writer Workbook #1: Write a Short Story. I received over a dozen entries. These four were may favourite. Enjoy. And if you wish to become an LTC Insider, please use the sign up form on the left side of this page. It’s free. Each letter writer has won a copy of this 15-page workbook. This is the story of a little girl and her lifelong wish. Many, many moons ago, a little girl sat beside a wishing well and wished very hard with all her might to become a highly successful author like the acclaimed Laura Thomas and J.K. Rowling. Day after day, she would write and write and write in the hopes of getting published or at the very least, win a writing contest. However, try as she might, her work never got published and she never won any writing contest, lest her ticket to fame and fortune was never granted. Soon, the little girl now a teenage girl began to lose hope and eventually stopped writing completely. Woe consumed her. One day, the teenage girl went to the wishing well where she used to go when she was a little girl and started thinking of what could have possibly gone wrong with her writing and why her work was never published. Perhaps her story wasn’t interesting enough to capture an audience or maybe her choice of words for the story weren’t right. She didn’t know. Then suddenly, it all struck her. She didn’t have a copy of the Polly Wants to Be a Writer Workbook #1: Write a Short Story, which is why she had never succeeded in her writing before. 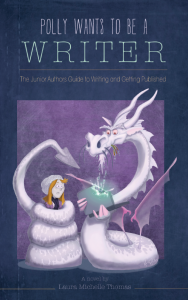 She was determined to win a copy of the workbook to help her write winning stories. And thus, the little girl is writing to you now, Laura. The worst thing happens to me when I have a pencil in my hand and a sheet of paper and I’m trying to write a story. I get an idea, write the first scene, and then I just blank out. I just don’t know how to go from one scene to another in a natural transition. I don’t know how to fix this problem by myself. I even went to my doctor and he said that I have a mild to serious case of writers’ block. Because of this, often at school, I suddenly think of my writing and work up a sweat of worry. I try to think of my stories as babies, if I don’t feed (or write in) them for a long time, they die. I need to nurture them until they’re big enough to go out alone into the world (or until they’re finished), but sometimes I have a hard time because of this disease I have. I can’t handle being a mother because of everything going on. I need advice on how I can pay better attention to my middle kids, when I have my two drama queens right beside me. Other times, I need to go somewhere but my children don’t want to go and I’m not exactly sure how I’m supposed to get them there. Do you understand my dilemma? At these times I always think to myself, I sure wish that I had Laura Thomas’ workbook for writing short stories. I yearn for it in the day, I cry for it at night, I wish for it in my dreams. But alas, fate does not deem me worthy of three dollars in my piggy bank. So I beg of you, give me this chance to raise my children better ‘step-by-step’. They say one generally gives up when he is almost near to success. I am not sure how far it’s a truth, but what I can say is that I have not given up. Even in midst of adversity I haven’t given up my passion for writing. Have you even seen a mother tearing up her daughter’s dairy just because she thinks writing is a waste of time? I have. Rather I have gone through such pathetic moments in my life. There has even been times when I have even been disgraced by my family and told that I was writing love letters under the cover of penning a story. Only God knew how wrong they were. No, I don’t have any grievances for all of it. Only I have a deep seated pain. How I have never received any support from my family! Yet, I have nothing to complain about. No matter how my family members are, I love them and can’t disrespect them. This life, including my passion for writing is my struggle…I know I have to fight my way to the top all alone. Just in case you feel you can help a student who has no money of her own whatsoever to buy your workbook (but has dreams in her eyes) I will be obliged to you. Writing why I would need a free copy of Polly Wants to Be a Writer Workbook #1: Write a Short Story, is itself, an honour for me. I was in very low spirits before I stumbled upon the Laura Thomas Communications website. I learned that it was open for contests and the thought that crossed my mind was: It would be like all other websites, not open for my country and requiring an entry fee. Imagine my surprise – and relief – when I read that it was open to all and that too, free of cost and the best thing, perhaps, was that it awarded certificates to all finalists – everyone needs appreciation. To be perfectly honest, at first I was not much interested in the workbook because of my previous experiences which were the same – buying an expensive book which turned out to be not much convenient. When I signed up for the mailing list, I received a tip from Laura Thomas. No way did I presume it would make obtaining the book my life mission. The tip was so simple yet so effective. It just advised to not submit the first draft of any stories. It artistically commended to put the “lump of clay’” in our drawer and forget it for two weeks, then edit it for mistakes. The advice from Laura Thomas made me feel like someone understood. It seems impossible to resist submitting our writing immediately after completing it and the best way to “combat” the urge would be to put it in the drawer. Only after reading that tip did I become conscious of the fact that the workbook was not ordinary – it was a gem. I needed the workbook to improve my writing. I had loved writing but some events caused to dislike it. The workbook is like a light; it beckons me towards it. But with that revelation, came another sad revelation – I could never get my hands on it, because though it is inexpensive while it deserves to be really expensive, I cannot afford it due to financial problems. I am, of course, thankful for what I have, but I would be forever grateful if I could get a copy of the book, for this is my only chance to get it. I already thank you Laura Thomas for providing me a platform to write freely. Polly Wants to Be a Writer Workbook #1: Write a Short Story, would serve as a great help to me and if I learn something from it, I will be sure to pass on the knowledge and help Laura Thomas to work to motivate other young authors like me. Write a letter to the editor of jaBlog! anytime and she may publish it and send you a special gift. Thanks a lot for publishing my letter in jaBlog and gifting me your wonderful workbook. Thank you Laura for finding my letter worthy enough to be published. The other writers have also written beautifully.